Just to say a big thank you to everyone who objected to the excessive plans for Craighouse. We will be posting again soon with more information on a number of topics that had to take second place over this consultation period. Before we do, here is a 40 second video of a few of us who went out to find the site had been “Yarn Bombed”, as its termed. What’s does that mean? Well, it’s a form of peaceful, colourful, good-humoured and, well…knitted…protest. 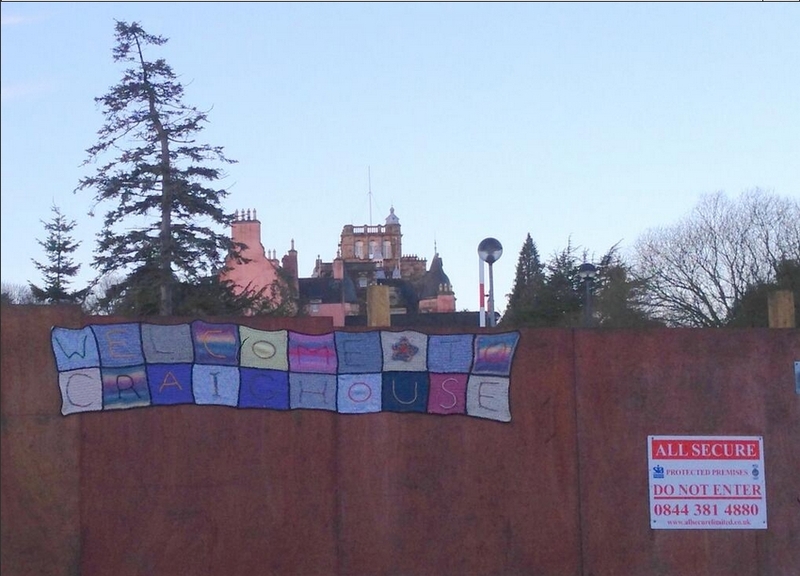 Someone – we have no idea who – had spent a lot of time (and stitches) on a colourful knitted banner to encourage everyone to keep using the site – despite the fact the main entrance has been sealed off and has large and unwelcoming Do Not Enter sign facing the public. Now that intimidating sign has been joined by a cheerful knitted quilt with “Welcome to Craighouse” and a nice knitted flower on it! We have fought hard to get these Do Not Enter signs taken down and have succeeded on getting them off the green space inside the site – but the impression given from outside the site is that the site is not accessible. However, there IS still pedestrian access at the lodge and Craiglea Place entrances (which is not mentioned on the barricade) and we – like the anonymous Knitted Protestor – would like to encourage everyone to keep using the site as it is totally accessible and open to the public, despite what appearances would suggest. It was very nice to feel that others were doing what they could to raise awareness of Craighouse and help the site. It gave us a real boost to see it there and here is our wee video of thanks to the anonymous knitted protester – thank you, whoever you are! has there been any further feedback from the Council about the barrier? The last I heard the council had admitted it was unlawful development but they were not inclined to take enforcement action. I still have not heard about the reasons for this, and the letter I got from the council was so full of gobbly gook that even as a planning officer I had difficulty understanding it (which is really unacceptable). Getting the barrier removed would be great. and yes. write to your councillors. Letters to councillors don;t have to be about material considerations. Just tell your councillor what you think.